The İstanbul New Airport infrastructure project in Turkey aims to become the first and largest infrastructure project outside North America to obtain Envision® sustainability verification. The Envision system rates sustainable infrastructure projects across the full range of environmental, social, and economic impacts. With a vision of İstanbul New Airport as one of the world’s top aviation hubs, the airport project strives to set an example not only as an innovative infrastructure project, but also a driving force making significant contributions to Turkey’s sustainable development. İstanbul New Airport will operate to more than 350 destinations with two terminals, six runways and an annual passenger capacity of 200 million people, once all the phases are complete. As part of the project, Istanbul’s New Airport will follow all internationally recognized sustainability practices, particularly related to the environment, biodiversity, ground improvement, local employment, supply chain and subcontracting network, human rights and stakeholder relations. 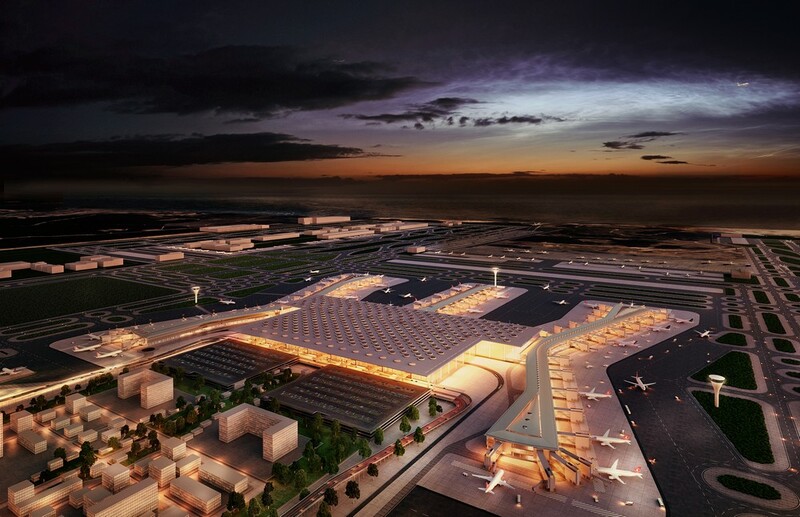 İGA, the company responsible for constructing and operating the project for 25 years, completed an Environmental and Social Impact Assessment Study for the İstanbul New Airport project in 2015 according to International Finance Corporation (IFC) Standards and the Equator Principles, and now the project is targeting verification in accordance with the Envision Rating System program, offered by the Institute for Sustainable Infrastructure. Through this reporting process for Envision, İGA has vastly improved its sustainability practices and achieved a sustainability culture within its organization. For today’s world, sustainability is key for development, and many infrastructure projects are working to adopt sustainability practices. Communication of sustainability programs plays a vital role for popularization among stakeholders and sector players. As a leading company with sustainable development projects, İGA also sets high standards for the communication strategies in its market and creates a model for others to follow. As a collaborative effort between ISI and the Zofnass Program for Sustainable Infrastructure at the Harvard University Graduate School of Design, the Envision system rates the impact of sustainable infrastructure projects as a whole. The ISI Envision system measures sustainable infrastructure in five categories: Quality of Life, Leadership, Natural World, Resource Allocation, and Climate and Risk. These key areas contribute to the positive social, economic, and environmental impacts on a community. İGA Havalimanı İşletmesi A.Ş. was founded on October 7, 2013 by a consortium comprised of some of Turkey’s longest-established construction companies, namely Cengiz İnşaat Sanayi ve Ticaret A.Ş, MAPA İnşaat ve Ticaret A.Ş., Limak İnşaat Sanayi ve Ticaret A.Ş., Kolin İnşaat Turizm Sanayi ve Ticaret A.Ş. and Kalyon İnşaat Sanayi ve Ticaret A.Ş. 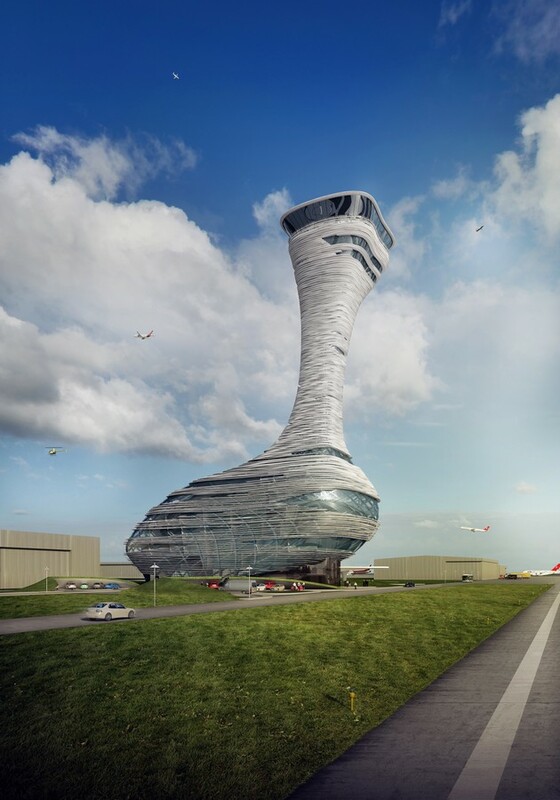 İGA has been awarded to sign the contract for İstanbul New Airport after placing the highest bid in a tender administered by DHMI on May 3, 2013. 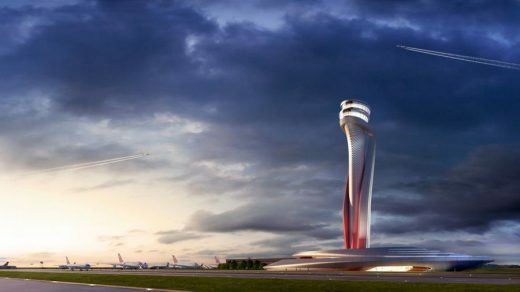 The Istanbul New Airport is being constructed over an area of 76,5 million square meters to the north of Istanbul, in 35 km distance to the city center. The construction will be carried out in four phases. The first phase will be finalized in 2018 with the opening of three runways and a terminal with 90 million passenger capacity. Once complete, the new airport will host flying to more than 350 destinations with three terminals, six runways and with an annual passenger capacity up to 200 million. 30.000 people currently work on the construction site of Istanbul New Airport. Once operational İGA projects to have 100 thousand direct employment and a total of 1.5 million with the sub-industry employment combined. Having adopted an environmentally friendly approach since the inception of İstanbul New Airport Project, İGA has gone beyond merely obtaining the EIA report as per legal requirements. The Company commissioned an Environmental and Social Impact Assessment (ESIA) report from ENCON, an internationally recognized environmental consultancy. The ESIA report serves as a comprehensive data source covering a wide range of issues, from air quality to ecology, waste management to traffic, climate change to social impacts. Action plans have been developed for both the construction and operation phases in order to manage all the work in accordance with the standards set forth by IFC standards and Equator Principles. Since the start of construction, the Environmental and Sustainability Team has worked in a responsive and diligent manner in close coordination with other relevant disciplines, both on site and at the headquarters. Envision® is the product of a joint collaboration between ISI, which was founded by three national engineering associations: American Society of Civil Engineers, American Council of Engineering Companies, and American Public Works Association, and the Zofnass Program for Sustainable Infrastructure at Harvard University Graduate School of Design. Information on ISI and Envision can be found on the ISI website, http://www.sustainableinfrastructure.org/. 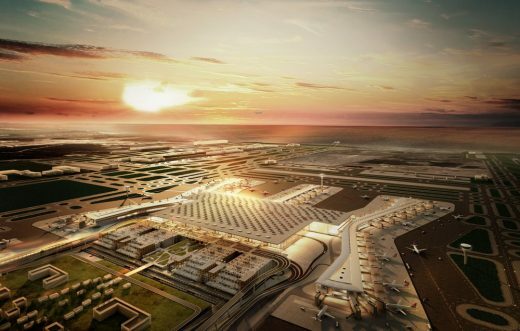 In the category “Future Projects – Infrastructure,” Istanbul New Airport has made it through to the finals of this year’s World Architectural Festival (WAF) in Berlin. Over 300 projects from more than 60 countries will be represented at the meeting of the global architectural community. Some of the best-designed buildings, both in development and completed, compete in 32 categories. This year’s World Architectural Festival will be held for the first time in Berlin, Germany, from November 16 to 18. The winners will be selected and announced during the festival. Among those on the shortlist in the category “Future Projects – Infrastructure” is Istanbul New Airport, currently being constructed by İGA Airports, the consortium that will also operate the airport for 25 years. The lead design is by Scott Brownrigg, United Kingdom, with the support of two Turkish offices for detail design, Fonksiyon and TAM/Kiklop. Their project scope includes architectural planning, aesthetics, operational issues, and buildability. With flights to more than 350 destinations and an initial capacity of 90 million passengers per year, the airport is the biggest infrastructure project in the history of the Turkish Republic. The centerpiece of the mega project is Terminal 1, the world’s largest airport terminal under one roof. The architectural design combines a unique sense of place with functionality; it acts as a gateway to Istanbul and Turkey. At the last MIPIM, the world’s most prominent real estate exhibition, in Cannes, France, Istanbul New Airport was placed on the short list for the Best Futura Mega Project Award. The airport will be operational in the first half of 2018. 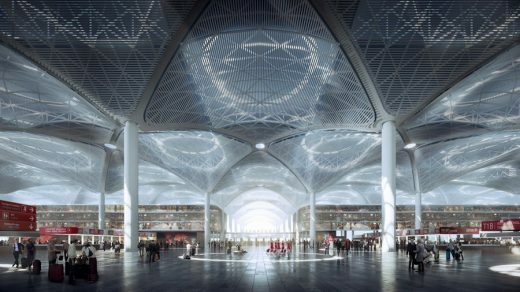 An international architectural team of Scott Brownrigg, Grimshaw, Nordic Office of Architecture and Haptic Architects have today released images of the terminal complex for the new Istanbul Airport. Appointed by the Turkish consortium of Cengiz, Kolin, Limak, MAPA and Kalyon, the plans have been created following an intensive design period.